Anthony Bourdain swore that the banh mi served at Banh Mi Phuong are just the best banh mi that money can buy. And as we were in the area, it seemed sensible to give them a try. So we did. Twice. Firstly on a food tour, then a couple of days later when we happened to pass by. What is a banh mi? It's a small French baguette, with a choice of fillings. There's no mistaking that this is the place Bourdain had his banh mi. There's the photographic proof on the wall. And on the tables. 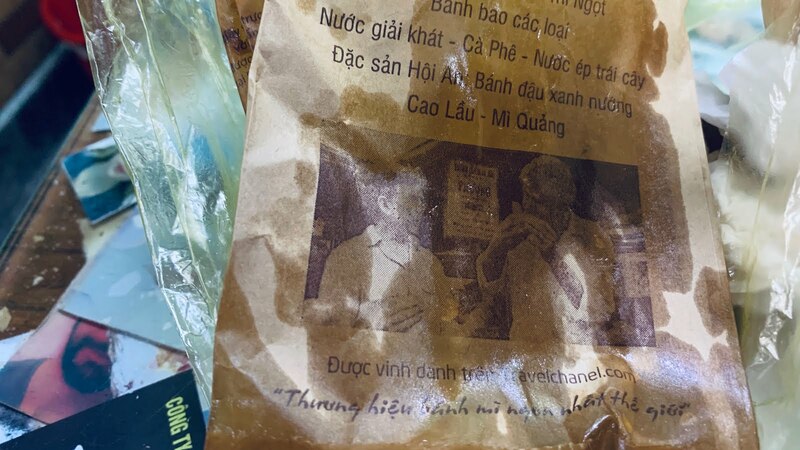 And on every single paper bag that the banh mis are served in. I wasn't brave enough to use the loo, but I bet there's a photo of Tony tucking into a banh mi in there too. Oh, and there's the exceptionally long queue of Anthony Bourdain foodies waiting their turn for Vietnam's most famous sandwich. Are they any good though? Or has fame and fortune led to a decline in standards at Banh Mi Phuong? I must confess my first sandwich was a little bit 'meh'. I chose pork, which in hindsight probably wasn't a wise choice. It was stuffed with a mix of sliced and chopped processed meat of dubious quality. Some of which was 'spit-out' meat. The bread itself was nice, but overall I was sufficiently unimpressed that a return visit seemed unlikely. But as I said, a couple of days later, we happened to be passing. And we were hungry. So Banh Mi Phuong got a second chance. I went for a tuna banh mi second time round. Mrs P copied me. And it was a huge improvement over the first experience. Much tastier. We didn't need to spit bits out, which is always a good thing. But here's my final verdict. I couldn't tell you if Banh Mi Phuong makes the best banh mi in Hoi An, or Vietnam for that matter. Because it was the only place we had banh mi. At a guess, it's probably at least as good as anywhere else. But I'm sorry to say that I think you'll dine on 80% hype and 20% filled baguette. Honestly, I could make a better sandwich at home.